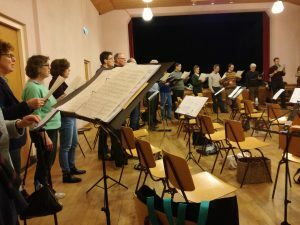 Leiden English Choir regularly takes on new members. Interested singers don’t necessarily have to be able to read music, but some experience singing in a choir would be beneficial. You can come to a rehearsal to get a feel for how we work (se contact details below). To become a member you will need to do an audition with the conductor who will take into account musicality, potential and the current membership in the various voice groups. She will then make a recommendation the LEC Board, who makes the final decision about membership. Rehearsals are every Wednesday evening from 19:45 – 22:15 in de Vrije School Mareland, Maresingel 19, 2316 HA Leiden. Choir members are expected to attend all rehearsals, and to invest time to learn the music at home (a website Coria is available to help with this). Membership costs € 142,50,- per year for full-time students, and € 285,- for others. Feel free to contact Choir Secretary Manon de Jager email: infolecleiden@gmail.com for more information or to plan to attend a rehearsal.